If you are both a dog lover and a runner, then you probably love the idea of having a canine running partner. Sometimes, running with dogs is more fun than running alone. It's also a great way to provide exercise to an athletic dog while keeping yourself in shape. Not all dogs are built for running. Many high-energy dogs can make excellent running partners, but some do not have the endurance or body type necessary to handle frequent runs. Avoid running long distances with brachycephalic dogs (dogs with short snouts) or other breeds that are sensitive to heat. They can suffer from exhaustion, overheating and breathing issues. 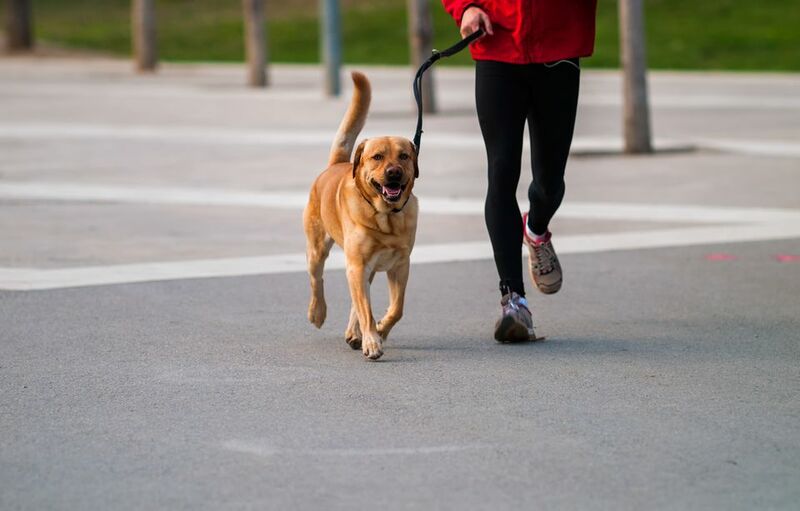 Although there are exceptions, giant dogs or other dogs prone to orthopedic issues can experience joint pain and injuries if they frequently run long distances. In addition, small, low-energy dogs may have trouble keeping up and can easily tire on long runs. Always be careful when taking your dog on a run, regardless of breed. Bring fresh water for both you and your dog and take breaks as necessary. Stop running and head home if your dog seems reluctant to run, has trouble breathing, acts painful, begins limping, seems overheated or appears otherwise distressed. Always consult your veterinarian before beginning to go on runs with your dog. Many of the best canine runners are part of the Sporting, Herding or Terrier Group. Most of those breeds have been developed over generations for their athleticism and endurance. Some mixed-breed dogs are great runners as well, especially if they are mixed with one or more of these breeds. If you are looking for a new dog that can become your running partner, check out some great dog breeds. 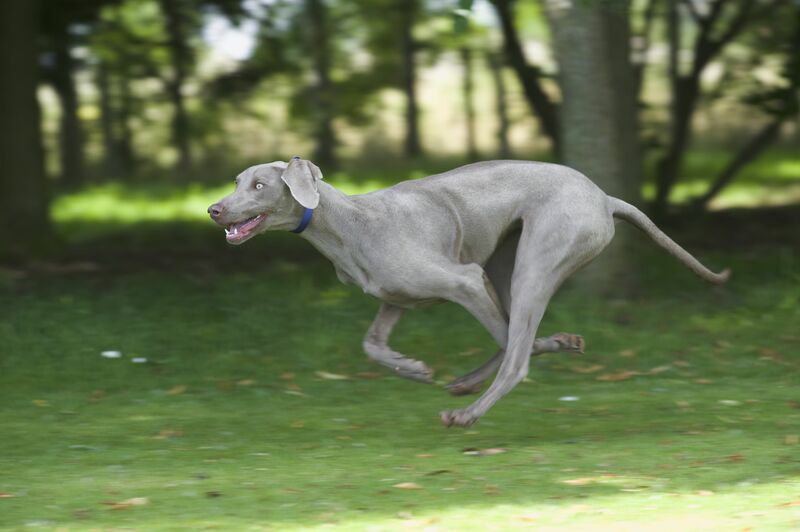 As members of the Sporting Group, Weimaraners are athletes by design. Their speed and endurance make them ideal running partners for both short and long distances. They can tolerate heat fairly well and enjoy lots of exercise. In fact, Weimaraners that do not get enough exercise and training may even develop anxiety or behavior issues. The Vizsla is a hard-working hunting dog that thrives on exercise. This Sporting Group member possesses excellent endurance and speed. The Vizsla can tolerate heat well and tends to stay very close to its owner. In fact, some have nicknamed this dog "the Velcro Vizsla." This breed can be your loyal companion and running buddy. When you look at this spotted dog, running may not be the first thing that comes to mind. Although they are in the Non-Sporting Group, Dalmatians are natural athletes that need lots of exercise to thrive. The history of this breed is not well-known, but it is certain that Dalmatians need to stay active and keep busy. They were once used as "carriage dogs" or "coach dogs" that would run alongside horse-drawn carriages. Of course, they are also known as firehouse dogs that assist firefighters in their work. The Border Collie is one of the smartest dog breeds around. As a member of the Herding Group, this breed loves to move. Border Collies are extremely agile dogs that can run fast for a long time. These dogs need to be kept occupied or they can become frustrated. Consider running with your Border Collie through somewhat dense, winding trails to add a bit of challenge. This breed can tolerate heat but does especially well in cooler temperatures. Another intelligent member of the Herding Group, the agile, athletic Aussie enjoys long, challenging runs. This is another dog that craves mental and physical stimulation. Avoid long runs on especially hot days as their longer coats make them able to better tolerate cooler temperatures. Aussies are smart, loyal, and full of energy, making them great companions and running partners. The Rhodesian Ridgeback is a member of the Hound Group but often seems more like a sporting dog. This large, muscular dog was originally bred in Africa to hunt lions. Today, the breed has retained its athleticism and endurance. Most Rhodesian Ridgebacks can handle somewhat long runs and warmer temperatures. Avoid running with this large dog breed until fully grown, usually around two years of age. The Siberian Husky is a member of the Working Group and was developed to haul sleds over long distances in the snow. With seemingly boundless energy, this breed loves to run.​ If you live in a cool climate, this dog can be your daily running partner. However, Huskies are not suited for long runs in warmer weather. Not all Terriers are great runners. However, a number of them are small, energetic dogs that enjoy long runs. If you want a smaller dog as your running partner, consider Jack Russell Terriers, Parson Russell Terriers, Russell Terriers, Rat Terriers or Wire Fox Terriers. If you prefer to run with a larger Terrier, consider an Airedale Terrier. Pit-bull type terriers like American Staffordshire Terriers, Bull Terriers, and Staffordshire Bull Terriers have a lot of energy but not much endurance or heat tolerance; they are suitable only for short runs in cooler weather. There are several dogs in this category that love to exercise. They have the strength, speed and endurance to make excellent running partners. These breeds include the Pointer, ​German Shorthaired Pointer and German Wirehaired Pointer. These dogs tend to do well in warm and cool temperatures and enjoy long distance runs. If shorter, fast-paced runs are your thing, then a Sighthound may be the perfect running companion for you. Their streamlined bodies are perfectly designed for sprinting and they love it. However, most Sighthounds are ultimately more like couch-potatoes than athletes. In general, Sighthounds also have very little fat and therefore do not tolerate cold temperatures well. Breeds to consider include the ​Greyhound, Whippet, Borzoi, Saluki and Sloughi.